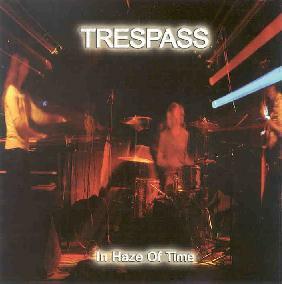 Trespass - "In Haze Of Time"
A prog/symforock band from Israel which is obviously inspired by bands like Genesis and Yes, Trespass seem to have released a debut album of rather average and mainstream progrock appeal on the French symforock label Musea. The band consists of Gil Stein on keyboard, vocals and guitar, Gabriel Weissmann on drums and Ray Bar-Tour on bass. "Creatures Of The Night" opens the album with some driving progrock with nice guitar and synth parts. "In Haze Of Time" is more jazz inspired and has nice flutes and vocals and reminds me abit more of King Crimson at first listen. The band lack some of the gothic flavor for this type of music and seem more medieval inspired for this type of stuff, with some references to Jethro Tull as well. "Gate 15" and "City Lights" follow up with more slick progrock with driving jazz inspired sections. The more laidback atmosphere of "Orpheus Suite" kickstarts a more driving tune, while "Troya" is more spacerock inspired in the beginning and becomes more chaotic and appealing after awhile. The closing "The Mad House Blues" is more bar music than anything else with some nice choruses. A rather uninspired album overall, though, Trespass' debut seems a little uninspired and much of the music rather "samey". The opener "Creatures Of The Night" is probably the most catchy tune on this record, and the synths remind me nicely of 80's Eloy. Advice: don't buy unless you are a truly inhuman symfo-rock nerd! You can email Trespass at: trespass_band@yahoo.com.